This blog was written by Julienne Brown, ATC, VATL. We can all agree that summers in Virginia can be brutal. And for athletes, the heat can be downright dangerous. So, do you know how to be safe when you’re stuck with a 106-degree day but still need to get ready for the big game? First things first! Know that heat illness is entirely preventable. Using acclimation techniques, understanding the heat index, proper hydration, and appropriately structured practices and games can keep your athletes safe. 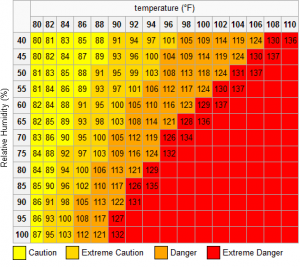 Learn how to read the heat index and what it means. The heat index is a combination of the temperature outside and the percent humidity in the air. Below is a chart to figure out what day’s heat index would be. Your athletic trainer will guide you on what adjustments to practices and games should look like, but it’s crucial during the summer months to always have a backup plan for practice – you may have days when going outside is simply not an option. Know what heat illness looks like. Heat illnesses can be categorized under heat exhaustion and exertional heat stroke. Heat Exhaustion: Symptoms include headache dizziness, nausea, muscle cramping or spasms, fatigue, chills/goosebumps, excessively flushed skin color. “Dazed” look. If accessible, notify your athletic trainer or other medical professional. Remove the athlete from the field and into an air conditioned building. Remove all unnecessary clothing and equipment. Place ice on neck, abdomen, inner thighs, wrists and ankles. Or place athlete in an ice bath from the neck down. 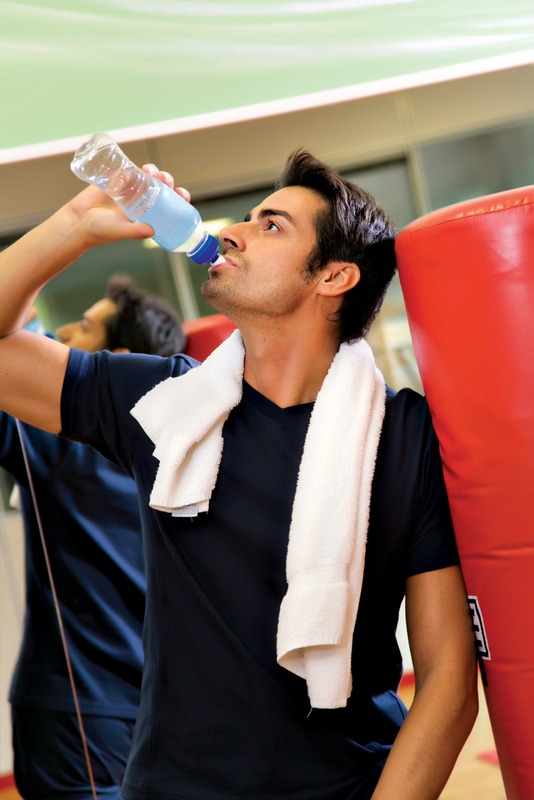 Ask the athlete to drink water and a lot of it. Heat Stroke: In addition to the symptoms listed above, and with a few exceptions) core body temperature of 105 degrees or greater, dry skin, vomiting, confusion, aggression, fluctuating consciousness or loss of consciousness, rapid heart rate. Contact your athletic trainer or other on-site medical personnel immediately. Get athlete immersed in ice as quickly as possible. Talk to the athlete to keep him or her conscious and to be able to determine any neurological/cognitive abnormalities. This condition can rapidly become FATAL! Acclimate! The first two weeks of practices should be spent acclimating the athletes to the heat. Below is an example of what the first two to three weeks of practices should look like. Using your best judgment, acclimate accordingly the severity of the heat. Choosing times for practice that are not during peak heat is an primary way to avoid the dangers of heat illness. Early morning and evening practices are ideal. Week 1 – practices should be shorter with minimal equipment (e.g. football players should be in helmets only). If you are holding two-a-days, consider doing outdoor activities in the first half of morning practices, moving indoors for the second, and holding the first half of afternoon practices indoors and moving outside only if it is safe or cleared by your athletic trainer. Week 2 – Still keeping shorter practices, add more equipment. It is imperative to be very cognizant of how the athletes are doing. Week 3 – Allow full practice time with equipment. Proceed with caution. *** All practices during peak heat season should have a water break to practice ratio. For example, 40 minutes of practice to 10 minutes for water and rest. For games, there may be days when additional time-outs need to be called by the referee for monitored water breaks. It is crucial that during this time (and all other time-outs) that the athletes drink water. Gatorade or other power drinks are acceptable but only if paired or cut with water. If they are available, keep small towels or cooling towels in a cooler of ice water for the athletes to use. Last but certainly not least, make sure ALL participants are hydrated. This means coaches, managers, and ball boys or girls. It is easy to get caught up in the game and forget to hydrate. For further questions, advice, or instruction on how best to shape a practice or game around an extremely hot day, talk to your athletic trainer or, visit www.nata.org and read up on the national guidelines by which our athletic trainers operate.